When my grandfather a stroke a few years ago, he became very sad (as one would), and really wouldn’t eat much of anything – until, for some reason, I came up with the idea of taking him some Devils on Horseback – perhaps I’d made some for a party and he initially got the leftovers. He DEVOURED them. Mine had cheddar cheese in the middle. I was nicking off from work in the middle of the day to rush home, grill the Devils and then courier them out to his rehab hospital twice a week, and he was much cheered. Virginia, how gorgeous is this story. When I am a toothless old woman, I want my (siblings’) grandchildren to come and feed me devils twice a week. What a devoted girl you were and what an inspired idea. Devils always more appealing to writers than angels and you can see why, especially post GFC. Personally i wouldn’t fancy doing that to an oyster, even if it was over age. And the old timers know best. I first tried these with proscuitto- it tasted like burnt brown paper. You need the FAT. Lovely story Virginia, Tasty sharp textured tidbits are much in demand for those in hospitals or homes. 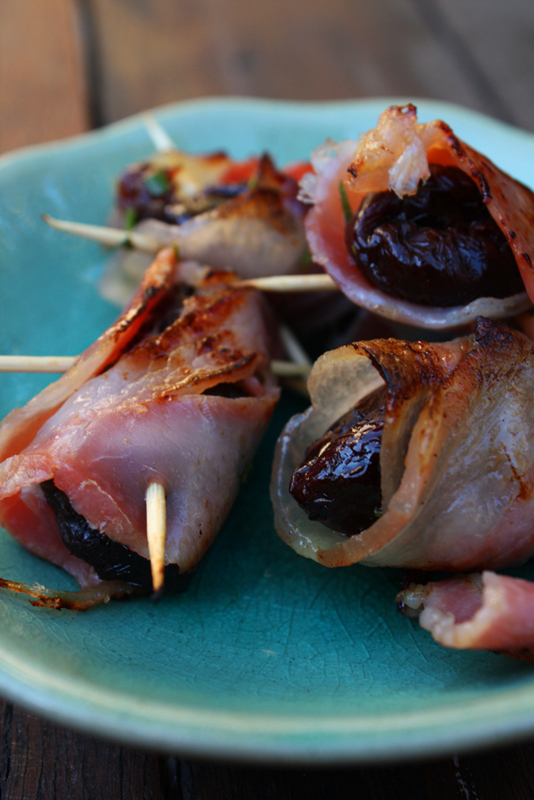 “….the origin of the devils on horseback name. It stems from Cornwall in the south of England at the turn of the last millenium, where Norman raiders would disguise themselves is suits of armour made by layering rashers of bacon. This armour had many advantages; Primarily it’s grotesque appearance was used to frighten villagers. Then, when the job was done, the armour could be cooked and eaten. Protection was roughly in the same class as leather armour depending on the thickness of the bacon. That is exactly what I like about them. I remember making these back in the 70’s as a young bride. Good cocktail party fare, and second cousin to the chicken liver (or oyster) placed on top of a water chestnut slice and then wrapped in bacon and broiled.